Libbys 5 Delicious Puddings 1953 Ad. This black and white March, 1953 ad states Hooray, now I can have a different flavor every time. 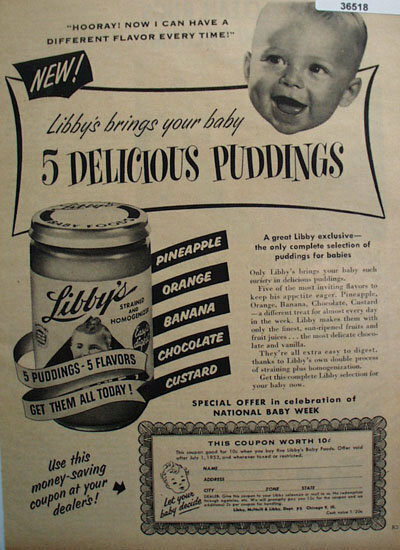 New Libbys brings your baby 5 delicious puddings, Pineapple, Orange, banana, Chocolate and Custard. Picture show Cheering baby. also jar of Libbys Pudding. Magazine tear sheet picture is taken through plastic and may show wrinkles or crookedness that is not in the ad. This Original magazine tear sheet measures 8 inches wide by 11 inches tall. Items Similar To "Libbys 5 Delicious Puddings 1953 Ad"